School and college leaver hoodies for 2019. Our hoodies are sweatshop-free and ethically produced without any child labour. The manufacturer's factories are independently inspected and certified by WRAP Compliance. The leaver hoody is becoming more widespread and increasingly popular from one year to the next. At Pier32, we regularly produce these souvenir garments for schools and colleges both locally and nationwide. The pupils and students love them and usually order them in time for end-of-year trips and excursions. The group photos look fantastic in year books too. The names on the back are arranged in-house by our own Designer and a digital proof is sent to your coordinator for checking before we go to print. 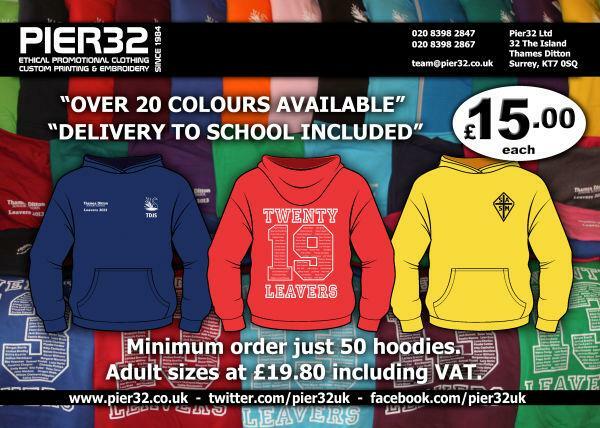 Please call us on 020 8398 2867 to discuss 2019 Leaver Hoodies for your own school, college, or university. Promotional t-shirts and other clothing. Screen printing of ethically produced t-shirts. School and college leaver hoodies. Our organic clothing and organic bags. Baseball caps and other headwear. The success story of the hoodie. Ethical promotional clothing from California. Onesies designed especially for branding. Our sailing, boating and yachting apparel. Our golf apparel and accessories.